Pom Poko features the clash between modern civilization and the natural world from acclaimed director Isao Takahata. The raccoons of the Tama Hills are being forced from their homes by the rapid development of houses and shopping malls. As it becomes harder to find food and shelter, they decide to band together and fight back. The raccoons practice and perfect the ancient art of transformation until they are even able to appear as humans. In often hilarious ways, the raccoons use their powers to try to scare off the advance of civilization. But will it be enough? Or will the raccoons learn how to live in balance with the modern world? Who would've thought Disney would dub this? I never would've imagined that Disney of all companies would attempt to translate this movie considering most of it is steeped in Japanese culture and because of their typical aversion to thematic elements such as the tanuki's "pouches", but I gotta commend them for doing so. Although some of the alterations don't always work, for the most part it's well done. I will admit the film plays better in its native language track, but the Disney dub is in no way terrible. I've honestly had no major qualms with any of their dubs for the Ghibli library, and any "true fan" who says you're watching Ghibli the wrong way should remember that both Ghibli and Miyazaki approve the Disney dubs. They don't think they compromise their work. Watch it subtitled if you prefer that version, but don't belabor others who would rather watch the visuals and the dubs (Miyazaki prefers viewers to see his movies in their language of choice anyway). Either method of viewing is fine, period. Anyone who praises the Disney-Ghibli dubs are totally, utterly wrong. They all are objectively terrible, legitimately hideous, atrociously blasphemous travesties of great films. 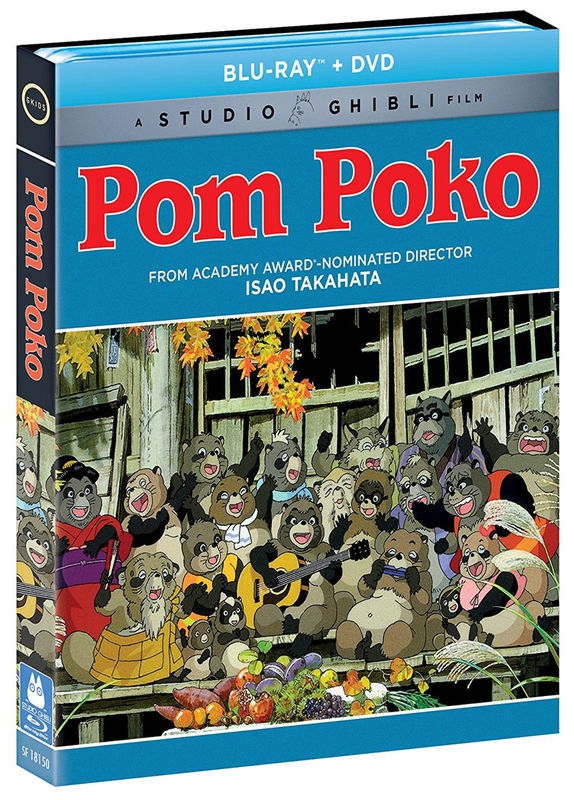 POM POKO is more of the same. First they totally get the species wrong (it's TANUKI, not raccoons) and worse yet, they butcher poems and songs that were previously perfectly done in Japanese with horrendously awful cacophonies, and they come up with the dumbest idea to PC the raccoon's privates (they're clearly TESTICLES! Raccoon pouch? What the heck). Even without talentless celebrities, the voices are all still terrible. Utterly lifeless and totally horrible. If Carl Macek was still alive he'd do real justice to this film, as his previous dubs were universally superior to these atrocious Disney dubs. Don't watch POM POKO in English. Only watch in Japanese. Otherwise don't bother. Not my favorite Ghibli film, but GKids makes some improvements. 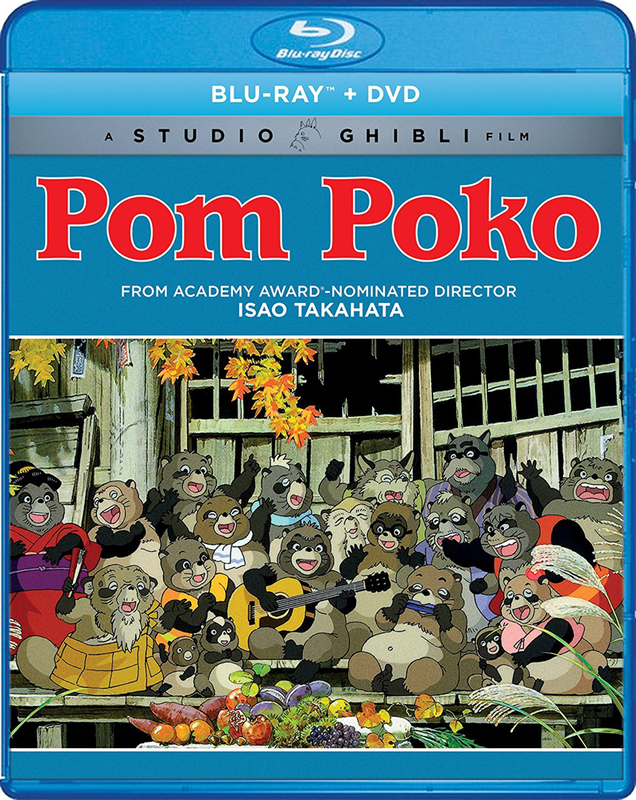 I can't exactly claim to be the biggest fan of POM POKO, but I do wanna take issue with people who insist that the dub is "unwatchable" and guilty of "whitewashing" a movie. Honestly, given the circumstances of this movie, if you were in the translator's chair, what would you do in order to make a movie like this work with audiences? I'm not saying all the choices work, but under the circumstances, Disney did a respectable job. The dub is also one of the few to primarily use traditional voice actors as opposed to big names (unless you count Jonathan Taylor Thomas). There are no standouts, but everything sounded solid to me. Gkids' reissue doesn't add any new extras and the video/audio quality isn't all that different from the Disney BD that I remember, but the literal subtitle track HAS been fixed. The Disney BD oddly forgot to term the raccoons' "testicles" in their proper term in the literal subs. For that, this GKids re-release does have a bit of an advantage. Extremely underrated Ghibli outing from the masterful Isao Takahata that deserves far more recognition than it gets. Most of the discussions revolving around it unfortunately usually just devolve into "lol raccoon balls," which is a big shame. There are some cultural oddities present to be sure, but the film surrounding those elements is equally weird and fully embraces a darkly comic style of storytelling. Essentially an allegory of fast encroaching industrialization versus the natural world viewed through the lens of a faux documentary, the film offers a lot of dramatic and dark concepts and realities to ponder over in conjunction with the aforementioned satirical edge of the humor, creating a film that's ultimately sad but also hopeful, a common thread throughout all of Takahata's works. The ensemble cast is also unique for a Ghibli film compared to most others that focus on a sole and clearly defined main character. Worst Studio Ghibli movie ever made! Studio Ghibli should be ashamed of this movie! I could never let my grandkids watch this without traumatizing them! Depicts raccoon dogs dying in various ways, including suicide. No conservation message other than that animals can never win against humans, unless they learn to blend in or remain hidden. I was VERY disappointed, and had to force myself to continue watching through to the end, in the hopes of some kind of redeeming message. There was none.